Or perhaps you found yourself in a melancholy mood, and chose instead a bluesy ballad to turn the trees gray and mute the blue sky to better reflect your internal despondency (pro-tip: check out The Cranberries for endless hours of that). Music has a unique and unparalleled ability to influence our attitudes and internal reflections, often near-instantaneously. Some active citizens of Littleton, NH have recognized this and chosen to use it to enhance the experience of walking down their hometown’s Main Street. Two musical installations have been creating memories in downtown Littleton in the past few years: the Piano Project on Main Street and Harmony Park on Mill Street along the Ammonoosuc Riverwalk. 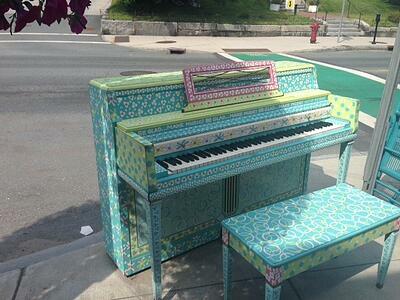 Multiple pianos were donated by area citizens and redecorated by local artists for Littleton’s Main Street Piano Project. The very first street piano was painted by artists from the Littleton Studio School. Today, these pianos can be found stationed downtown in front of The Nest, Little Village Toy & Book Shop, and (yours truly) Chutters Candy Counter. And the motto of Littleton’s Piano Project? The pianos are often incorporated into Main Street events, such as the annual Glad Fest in June, when buskers bring their guitars and ukuleles and gather around the pianos to perform downtown, the free mid-summer music festival “Music on the ‘Noosuc” on Saturday, July 8th, and the upcoming “Art in the Mountains” 48th Annual Art Fest on Saturday, September 23rd, when musicians are scheduled to play throughout the day. Music on Main Street creates a unique experience for the Littleton visitor – a welcoming and harmonious atmosphere that sticks in the mind and will be remembered fondly for years to come. The Piano Project was recently emulated in the downtown of Nashua, NH, all because a Nashua resident stopped in Littleton with a friend for lunch one day. They were eating outside, when a handful of passersby on the opposite side of the street stopped at one of the pianos. One member of the group happened to play, and the rest were jovial enough to sing along. What could be more delightful on a beautiful summer day than enjoying the sun while people play music and sing along with friends and strangers alike? Music brings people together. 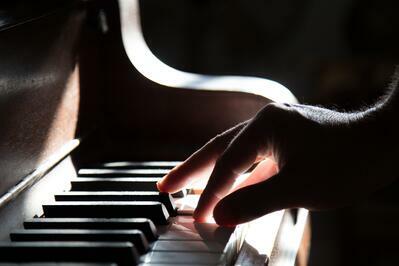 Perhaps one person doesn’t play piano, but sings, or raps, or has great rhythm. Those who find themselves with the opportunity to sing or make music with other people usually find the temptation too great to pass up. Music on Main Street provides not just a soundtrack to the downtown – but a meeting place for community to flourish. A harmony park is a nationwide trend where durable musical instruments are installed on a main street or in a park for residents and visitors passing by to play and enjoy. The structures are attractive and weather-resistant, and intended to last 25-30 years while stationed outside year-round with minimal upkeep. Dave Ernsberger was instrumental (pun quite definitely intended) in coordinating with Freenotes Harmony Park and raising the funds from local businesses to bring these musical instruments to downtown Littleton. After a vacation to Sedona, AZ, where he witnessed tourists playing at their own harmony park, Dave made the suggestion to the Redevelopment Commission, and, incredibly, the park was up within 2 weeks! Littleton’s Harmony Park officially opened in June 2015 with the annual Pollyanna Glad Day celebration. 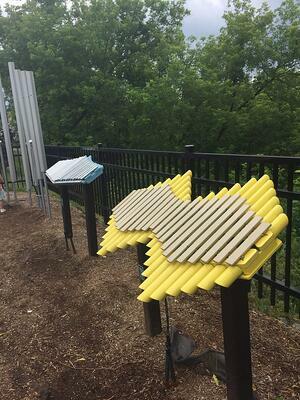 Six working percussion sculptures – the Piper, Swirl Chimes, Imbarimba, Tuned Drums, Pegasus Chimes, and Contrabass Chimes – were installed along the Mill Street walkway, overlooking the Ammonoosuc River. The instruments are located across from Tree Harp Park that abuts the river, so passersby can sit, watch the water flow by, and listen to the notes and rhythms floating down from Harmony Park. 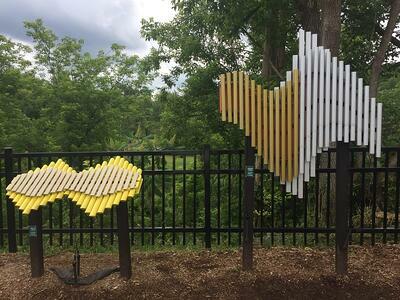 Harmony Park is open every day from 10:00 AM to 8:00 PM and is free to the public. Attached rubber mallets are used to play the xylophone-type structures, while the big, colorful drums are played by hand. The instruments at Harmony Park are intended for all ages and abilities, so people from all walks of life can enjoy them. No matter your musical skill and talent (or lack thereof), these working sculptures are designed to sound pleasant, so even if you consider yourself tone-deaf, you may as well stop by and give it a chance! The Piano Project and Harmony Park are reflections of the diverse musical and artistic talents of the residents of Littleton, NH. Perhaps on your next trip to Chutters, you may come across an aspiring young Beethoven or Chopin playing at our door – or perhaps you may wander down the road and join an impromptu jam session with no-longer-strangers at Harmony Park.